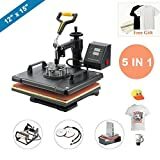 If you're interested in making promotional T-shirts, baseball caps, and mugs, a heat press machine is a great idea. It allows you to print decals onto blank T-shirts and the like. You can print the T-shirt right before the customer's eyes. Some models are surprisingly affordable as well as versatile. If you're ambitious enough, the machine can pay for itself in a short amount of time. There are also a variety of patterns that you can apply to your items, and they use different methods of getting the pattern onto the fabric. 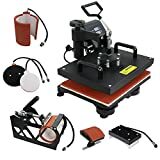 There are three designs of presses: You can purchase a clamshell heat press, where you place the T-shirt (for example) to be pressed on a metal plate, place the decal on top of the item, and then lower a heated upper plate on top of it. There are also swing away models, where you swing the upper plate into place and press the decal onto the item. Finally, there are draw presses, where you place the item on the lower plate and slide it underneath the heating unit to be pressed. Upon completion, you then draw out the lower plate with the finished product. Clamshell: This type of press will consist of two metal plates or platens. The bottom platen is where you place the T-shirt or some other item to be pressed. The upper platen heats up, and you lower it down to melt the decal onto the T-shirt. The controls will consist of an on/off button, a button for setting the platen's temperature, and a timer button for how long heat should be applied. It will get the job done the most quickly of the three models, although it may be less accurate. Swingaway: This also has two platens, and you place the T-shirt or some other item on the lower platen. But here you swing the upper platen into place and press it down. This has greater precision and applies pressure more evenly. It is best for thicker garments, such as sweatshirts. But it takes longer to set up and use than the clamshell version. Draw: Here, the lower platen can be slid out, while the upper platen is stationary. This has the advantage of being safer, because the heating element is totally concealed. What you can print: Besides T-shirts, you can print decals on sweatpants, leggings, canvas bags, swim wear, and mouse pads. Test it out on an old T-shirt first: Before pressing, it's always best to try it on an expendable object first, like an old T-shirt. That way, you can make sure that the temperature and time settings are correct for the type of material. Transfers: The designs you put on the T-shirts are usually heat-press vinyl. But there are also solvent printable films and dye sublimation, which turns the solid ink decal into a gas that is absorbed into the fabric of the T-shirt or baseball cap. This makes a permanent bond with the fabric, which shouldn't wash out. It is recommended also to use a Teflon heat transfer sheet between the platen and the decal, for more even spreading of the heat. T-shirts: You should set the heat press to 350 degrees Fahrenheit and press for 10 seconds. But these settings may vary depending on the type of machine. Plates: There are decals that you can press onto a plate. The temperature and time limits are the same. Baseball Caps: You've seen vinyl designs printed on baseball caps. This will require a special clamp to hold the baseball cap properly in place. Cups/Mugs: Here also the machine requires a special device to house a cup or coffee mug in place when printing a picture on it. Applying pressure: There is also a pressure knob on most devices, which you can adjust. For example, the Pro World Transpro has a knob that if you turn it clockwise, it applies more pressure; turning it counter-clockwise will produce less pressure. The pressure is important, in order that you can adjust for your own body weight and physical strength: if you don't press hard enough, the decal will not transfer properly. And if you press too hard, your back might start to hurt after a few printings. Holding the decal in place: It is best to tape the decal in place with heat sublimation tape on the T-shirt before pressing it. This is especially necessary when printing on mugs and baseball caps, where the object is curved instead of flat. Timer: It's best to use a heat press with a digital timer. This way, you have less of a risk of scorching T-shirts by leaving them under the press for too long. 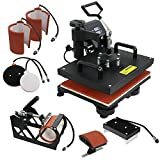 Power Press—are makers of heat press machines. They make both clamshell and swing-away style machines. Their machines can print on T-shirts, caps, and cups. 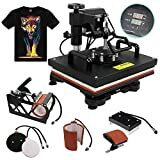 Promo Heat—make presses for designing T-shirts, as well as the accessories necessary for printing on mugs and caps. 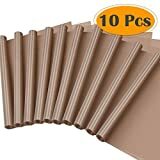 Their heat presses are adequate both for home projects as well as commercial grade equipment. Their headquarters is located in Sunrise, Florida. ShareProfit—are makers of swing-away sublimation T-shirt presses as well as the teflon heat transfer sheets that are required. They also make cellphone accessories, fruit peelers, embossing machines, and more. Iglobalbuy---sell arts and crafts goods, as well as outdoor recreation equipment. They sell digital heat presses, thermal copiers, welding machines, foil stamping machines, and more. 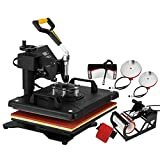 Mophorn—make arts and crafts machines, as well as tools and home improvement products. They make heat presses, car lifts, dollies, lens cutters, optical fiber splicers, and more.